pendant light, bedroom light, cafe light, decorative light, lampshade light. This cast aluminum, 2-bulb ceiling fixture was manufactured by The Edward N. Riddle Co. in Toledo, Ohio during the 1920's or 1930's. The patent date is shown on the backside.July 8, 1924 (see photos). Gotta love Mid Century Tronchi light fixtures, and this is no exception! An exceptionally superb very large cascading chandelier with 10 candelabra lights surrounded by handmade textured glass which creates a warm glowing sculpture on your ceiling, a block of icy Murano goodness. Design/ Manufacturer: Lyfa. Period: 1970s-1980s. Design/p roducer: Vitrika. Material/color: copper alloyed aluminium top set with pressed glass in diamond patterns. Type: Pendant ceilling lamp - hanging light. Period: 1960s. Will need to be rewired for safety. Just a great piece of lighting art work from an era long gone. The light socket rings or bobeches are included on its original 5 solid brass and porcelain "fat boy" sockets. The chandelier is a hanging fixture. It's stunning. Sparkles with radiance even when not illuminated. Shows wear typical of age and use, but as you can see displays beautifully. The tapers are old and you may wish to replace them with minimal flea bites to prisms. Here is a new handcrafted tin hanging light. Finished with a fine crimping on the edges and a rustic punched willow design. bulb ( Ceiling plate kit included. Includes 7 feet of wire and 3 feet of chain. ). Beautiful art deco design and detail matching through out. This fixture is small, light and cozy. Notice the copper bottom with the red and green finial. All installation hardware is included for your convenience. 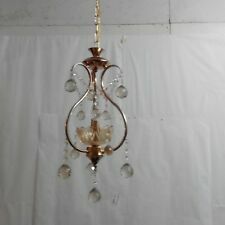 STATELY Antique Bronze Brass French Beaux Arts Chandelier XL No Crystal 26"
Exquisite regal chandelier with 6 side lights. This is a stunning piece and in beautiful kept condition showing wear typical of age and use and one may wish to polish but as you can see displays lovely. This old light will have to be rewired the wiring is very old. It has a place for three lights. A very neat old chandelier. THIS ONE IS IN VERY GOOD OVERALL CONDITION & DOES HAVE SOCKET. Rare and beautiful original 1930's antique Porcelier Art Deco flush mount porcelain ceiling fixture with three glass slip shades. It had three new sockets put in about 15 years ago, and works fine. Cosmetically it has one tight vertical crack on one side that was there when we got it, and is very stable (see close up photos). A couple of the shades have a few flea bites along bottom edge where they rubbed against the porcelain bottom piece, not visible when fixture is together. It measures appoximately 11 1/2" wide and about 9 1/2" long from ceiling. It displays very well, and we always got compliments on it in our kitchen. We are moving and updating our home, so it's time for it to go to a new, more appreciative owner. See photos for more detail. 480 pages of all things electric in the 1920's, thousands of fantastic illustrations of electric peerless fans, tools, wire, hubbell switches. Nice solid condition, covers have edge wear. The shade or globe is very ornate and deeply molded. Has an appearance of a ruffled cloth shade. No makers mark was found. The lighting fixture includes new and antique parts for hanging. The fixture was rewired using new wire. A scarce, sleek, elegant pair in high mid-century minimalist style to provide a stunning accent for your period or retro room. For sale is a 1920’s era brass hanging light fixture with four sockets. Each socket is in fully functioning condition and contain Bryant fat boys with a paddle switch. Each light operates independently to give you the option of or less lighting. Has a Gothic vibe and very unusual profile with a more round drum shape as opposed the the ordinary stepped style. I have done my best to arrange the crystals as the previous owner had them, but of course you could arrange them differently. For sale is ONE Antique 1930s Schoolhouse Milk Glass Light Fixture (6 available in this size). Featuring a spun aluminum base and tradition globe with deco inspired curves. These were salvaged year ago from a building in Louisville KY that was being torn down. This will be the focal point of any room it adorns. Simply stunning complete with original canopy ready to hang. Wear typical of age and but as you can see remarkable preserved and ready to decorate. Antique 1920s Art Deco Custard Uranium Glass 5 Light Chandelier. Featuring smooth late 20's streamline designs, and custard glass on a brass body. Its in "as found" condition. They also do not glow under UV light light the darker colored body does. From a funeral home auction. Brass with hammered aluminum arms. There are some cracks in the bulb cups but its not structrual and wouldn't really be noticed,see pic 4. Needs to be rewired . A dent as seen and the glass shade is ill fitting but works. See tape measure for dimensions. I pack well and usually ship out quickly,check my other listings for more great items. As you can see from the original style book, all of the high quality Imported bohemian lead crystal was hand polished on a wood wheel and deep Waterford cut. This five arm chandelier actually has 6 lights. 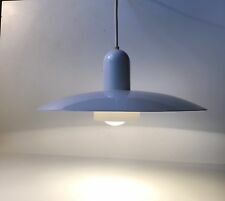 THESE MODERN DESIGNS WHERE MANUFACTURED IN GERMANY AND IS IN GREAT CONDITION, TECHNICALLY CHECKED AND RUNS BY 5 x E14 LIGHT BULBS ( not included). (Rod can be short to your own need). Authentic 1900 chandelier ceiling lamp in perfect condition. Stunning original 1930's antique Art Deco chandelier with hanging bell slip shades. Polychrome fixture has a great gothic look to it, with silver and gold finish. The five caramel colored thick glass shades hang over your choice of standard base light bulbs on hooks from the five arms. The fixture was re-wired about 15 years ago with period correct cloth covered wire, and it works fine. Cosmetically it is in great shape with no damage to the fixture. One shade has a very tight vertical crack (shown in close up photo) that was there when we bought it, and is stable (shade still "rings" when you hit it with a fingernail) - see close up photo. A couple of shades also have a few flea bites on inside bottom edges, not visible from front (also shown in close up). The glass globe has a polka dot design throughout. The interior section where the dots are present has a raised glass. I have not tested this chandelier so I am unsure if it works. The interior section holds 3 light bulbs. Both are in excellent condition. The original light sockets were defective and unsafe to use and were replaced with new old style brass sockets. The original brass ceiling canopy is also included. Length is about 9", width is about 4 1/2". Fixture extension from the wall is about 7". Socket and wiring are new. Featuring brass construction, hand flowers, and an electrified font. Everything is in "as found" condition. A couple dents can be seen on the counterweight. The glass shades are free of any cracks, or breaks. Big solid glass lamp shade in beautiful marbled milk white glass with orange slag veins. Has three holes for hanging ropes. An exceptional antique piece! Producer: Coronell. Designer: Verner Schou. 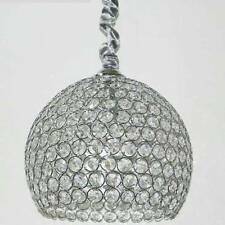 Type: Pendant ceilling light - hanging lamp - chandelier. Material/color: copper partially black painted - all solid. Model: 'Tongue' pendant. Origin: Denmark. Design/ Manufacturer: Nordisk Solar. Period: 1970s. Material/color: white Powder coated Steel with white reflective inner-shades. New E14 lamp sockets have been installed. Old and original. Nothing added. Mostly hand tied. Gorgeous 4 light display. Great for little girls room or even closet. Nice size for small spaces with a very elegant design. The cain with canopy can be easily shorten to your own needs. THIS AMAZING CHANDELIER WILL WORK AND FUNKTION IN ANY COUNTRY, AS LONG AS YOU USE YOUR REGIONAL EDISON LIGHT BULBS, OR YOU SIMPLY CONVERT THE SOCKET. A pair available. Rewired and ready to hang.